The Movimiento Social Republicano (MSR, Republican Social Movement) was established in 1999-2000 as a national revolutionary movement, rejecting Francoism but defending a "social" economic program of fascist and national-socialist orientation. The main leaders of the party, Juan Antonio Llopart and Jordi de la Fuente, claimed to be "leftist" and "national-bolshevik", respectively. Opposed to the traditional, semi-circular classification of political parties, they defended the "horseshoe theory" that claims that extreme leftist and extreme rightists parties are contiguous on the social and economical aspects. The MSR pushed a centralized Spain, organized as a republic led by a President elected by universal suffrage and granted extended powers. On the model of German national-socialism, the MSR bitterly criticized the banking system and the alleged "Jewish Zionist" lobby. The MSR's decline started in the 2010s, when the party broke out with the football ultras who formed most of its youth branch, Liga Joven; deemed not serious, they established in 2014 Hogar Social Madrid, a splinter group led by the charismatic Melisa Domínguez. The party also lost his historical leaders; Llopart formed in July 2014 another splinter group, Soberanía y Libertad. On 11 November 2018, the 8th Extraordinary Congress of the MSR, held in Madrid, decided the disbanding of the party, which had remained inactive since 2014. The long declaration signed by the "Militant Community of the MSR", was, however, rejected by other militants of the party, who claimed on social networks that the MSR was still alive. The flag of MSR was black with the party's emblem placed on a white disc (photo, photo, photo, photo, photo, photo, photo, photo).The flag also exists with the central disc flanked by horizontal stripes in the Spanish colors (photo). The emblem of the MSR, made of a red-white-black flame surmounting the party's acronym in black letters, is a straightforward reference to the Italian Movimento Sociale Italiano (MSI), founded by Mussolini's nostalgists and for long a reference and inspiration for neo-fascist parties in western Europe. The similarity in the names of the MSR and the MSI is, of course, not coincidental. When used on flags, the emblem of MSR features the flame with a raggy border, which is smooth on the party's self-standing emblem. The similarity in design and colors of the flag of the MSR with the German Nazi flag is not a mere coincidence, either. 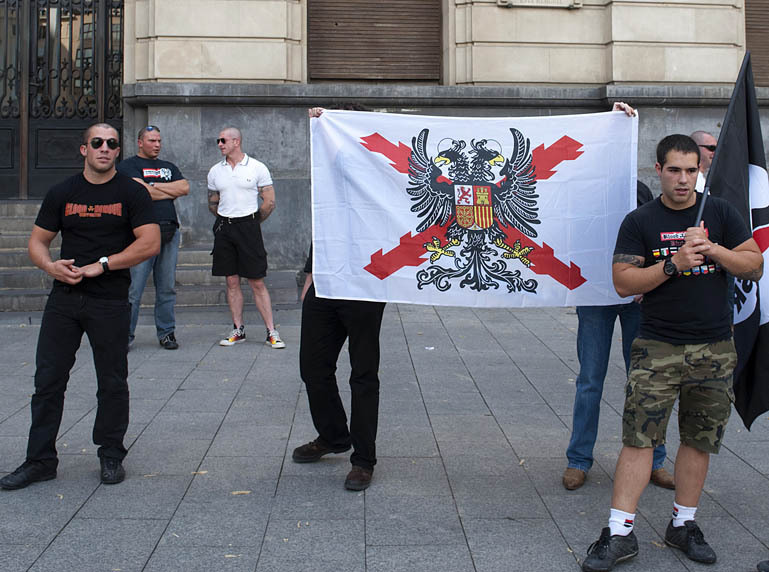 In street demonstrations, the MSR also used a mistaken version of the (illegal) Spanish flag of the Francoist period (photo) and the black flag with a white Celtic cross commonly used by neo-Nazi groups (photo). MSR also used a white "Carlist" flag (photo). Liga Joven (LJ-MSR, Youth League), the youth branch of the Movimiento Social Republicano, was self-styled "a youth association created by a group of young students and workers ashamed by the economical and labor situation of the times and concerned by our future". Members of the group were indicted in 2014 following a series of violent actions perpetrated in universities in Madrid, Toledo and Guadalajara. The flag of Liga Joven was red with the league's emblem, made of a black four-leaved clover placed on a red background and surrounded by a black ring (photo, photo, photo, photo, photo, photo). As for MSR, the similarity in design and colors of the flag of the league with the German Nazi flag is not a mere coincidence. Hispania Verde (HV; blog) was registered in 2011 by the Ministry of the Interior as an environmentalist association. Its activities are centered around the controversial issue of the reintroduction of the bear in the Pyrenees mountains. As its motto, Ecology and Identity, states it, HV opposed to the alleged "leftist" vision of nature conservation of biodiversity issues. The opponents to HV have unveiled the close connection of the association with the Movimiento Social Republicano. Accordingly, 40 collectives have denounced in 2014 HV as a neo-Nazi group and called to boycott and prevent their actions. The flag of Hispania Verde (photo, photo, photo) is square, white with the movement's emblem, which features a bear's face on a green background, in the center.